1 - The peaked mountain with snowflake symbol indicates a snow tire. 2 - M+S (Mud and Snow) indicates an all-season tire. 3 - P stands for passenger vehicle (or you may find L for Light-duty vehicle). 4 - 195 is the width of the tire in millimetres. 5 - 60 is the “aspect ratio” - the ratio of the height of the sidewall to the width, expressed as a percentage. 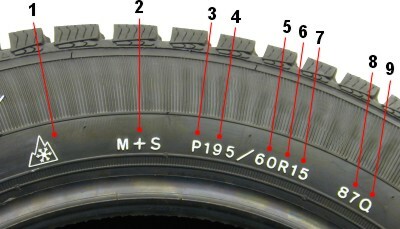 6 - R means the tire has radial construction. 7 - 15 represents the wheel diameter in inches. 8 - 87 is the load index. 9 - Q is the speed rating. The maple leaf symbol is the national tire safety mark of Canada. 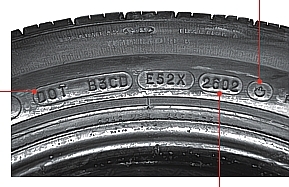 It means the manufacturer certifies that the tire meets Transport Canada requirements. The four digit code identifies the date of fabrication.